Today, the only way for a complex organization to manage regulatory change is through the thoughtful application of modern services and technology. If there haven’t been judicial decisions yet that explicitly reach this conclusion, I submit that there will be many within the next few years. Regulatory agencies are beginning to define next-generation compliance, and the courts will soon follow. Just one example is the U.S. EPA’s Next Generation Compliance Tools in Civil Enforcement Settlements memorandum (issued Jan. 7, 2015) which calls for use of modern information technology, electronic reporting, enhanced transparency of compliance data, and other methods to more easily identify and address environmental compliance problems, report compliance information, and facilitate review and analysis by the EPA and the public. Now, more than ever before, there are services that monitor thousands of sources of information and can provide up-to-date notification and analysis customized to each organization’s needs. There is technology that can deliver that information into the organization and map it directly to the established policies, procedures, and controls that would be affected by any regulatory change. 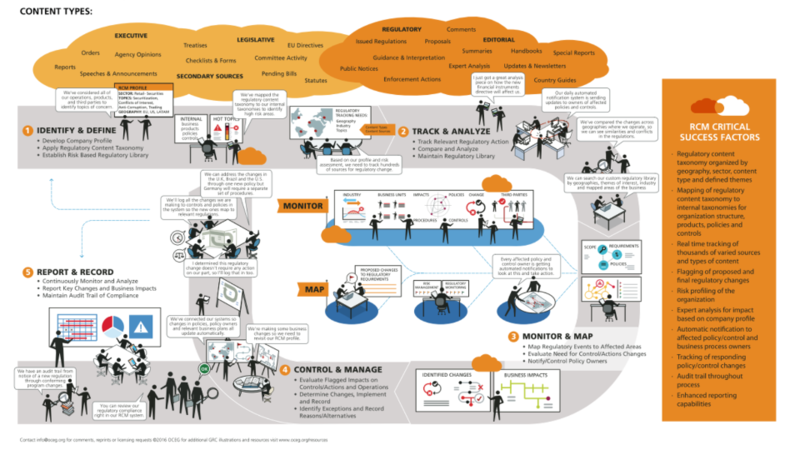 OCEG and Thomson Reuters have prepared this illustration to show you the key steps in effective regulatory change management. We have emailed instructions to access Regulatory Change Management to . Make sure the email arrives in your inbox: either add "support@oceg.org" as a safe sender to your email platform, or if you use Gmail, drag our email into your Primary tab.